Rasulullah ﷺ once said, «إِذَا لَمْ تَسْتَحْيِ فَاصْنَعْ مَا شِئْتَ» “If you have no shame, then do whatever you like” [Narrated by al-Bukhari and others]. The Selangor Islamic Religious Department (JAIS) seems to have done that, when it once again tainted the houses of Allah (swt) with a sermon defaming Hizb ut Tahrir. The sermon entitled “Ku Sangka Intan Rupanya Kaca” (“What I thought was diamond turns out to be glass”) was issued by JAIS and read in mosques throughout the State of Selangor which content listed Hizb ut Tahrir as a deviant group along with Ahmadiyah (Qadiyani), Shia, Islam Jama’ah, Wahhabi and others. JAIS does not seem to have shame before Allah (swt), His Messenger ﷺ and the Believers when they continue to defame Hizb ut Tahrir with allegations that they failed to prove until now, and with the permission of Allah (swt) they will continue to fail. In the sermon, JAIS mentioned that Hizb ut Tahrir is also banned in Turkey, Saudi Arabia, Egypt, Libya, Yemen, Jordan and others. Does JAIS not know that Hizb ut Tahrir is “banned” in those countries not due to the defamatory allegation as contained in the fatwa of Selangor? 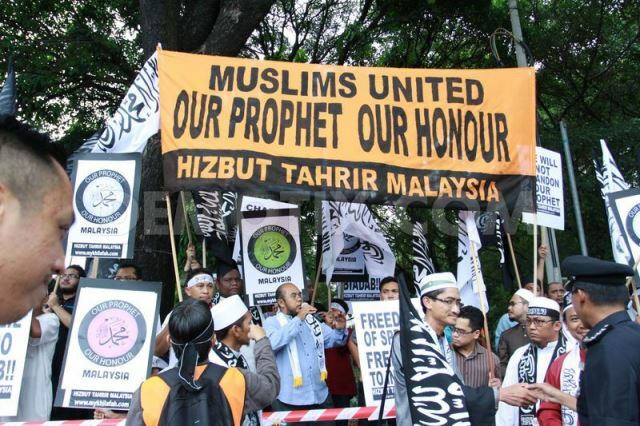 Does JAIS not know that Hizb ut Tahrir is “banned” in those countries because all the rulers in those countries are puppets of the West who hate Islam and do not want to see Muslims united under Khilafah (Caliphate), which forms the work of Hizb ut Tahrir? Rulers in those countries are only obedient to their Western master and on that basis, they have banned Hizb ut Tahrir which they know is working to abolish the Western hegemony on the Muslim world and uniting the Muslims under the ruling of a sincere and pious Khalifah (Caliph) who fears nothing except Allah (swt). Is JAIS that ignorant to not know all these and to not know that the ban on Hizb ut Tahrir in those countries has nothing to do with the fatwa that JAIS had unshamefully casted on Hizb ut Tahrir? If JAIS has any shame at all to Allah (swt), His Messenger ﷺ and the Believers, JAIS should have not “sold” the names of Turkey, Saudi Arabia, Egypt, Libya, Yemen and Jordan to “legalize” their fatwa against Hizb ut Tahrir!